Standley Feed has all the products you’ll need to set up watering troughs for your livestock. With summer months ahead, it’s very important that you provide consistent drinking water for cattle, horses and other animals on your ranch or farm. We have valves from Trough-O-Matic and Hudson Valve that will release water at the rate you want. 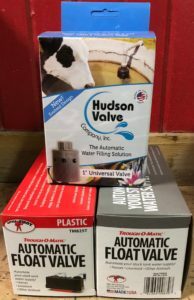 For the past 43 years, the Hudson Valve company has been making quality indestructible valves that have been used in many watering needs. These valves are versatile in that you can use them for personal home use or large-scale industrial use. It uses water pressure to close the valve instead of a lever arm and ball. The Hudson Valve is very easy to install. It can be installed directly onto your existing plumbing or you can use a Hudson Mounting Bracket and a standard hose. Keep a consistent level of fresh drinking water in your livestock and animal drinking troughs with the Trough-O-Matic. This plastic float valve features two metal clamps for attaching to a stock tank, drinking trough or other application where keeping a consistent level of water is important. This valve is capable of 245 gallons per hour flow rate and operates between 20-50 psi. Black housing is made of high-grade polystyrene for added strength and durability. 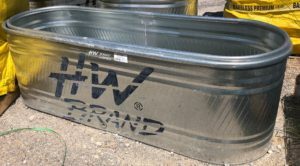 Come down to Standley Feed and ask us how we can help you set up your watering troughs before summer! This entry was posted on Tuesday, April 17th, 2018 at 4:51 pm	and is filed under Cattle, News & Updates. You can follow any responses to this entry through the RSS 2.0 feed. Both comments and pings are currently closed.